This pill dispenser was great! User friendly for the caregiver and easily relatable for the client ! This is a fantastic product that allowed my mother who high number of medications live independently. Easy to operate and great support from company when needed. The pill box had great flexibility with adjusting time schedules as well. this is a great product. it is easy to set up, easy to use. my mother was able to be walked through using it over the phone and the reminders were so helpful. I would recommend medminder to anyone who has or knows someone with memory problems. My mother's Alzheimer's specialist recommended MedMinder to help manage her medications. The system was easy for me to setup and manage. Most importantly, it was simple enough for her to use and stay compliant with her meds. A couple of times, I called customer service with a machine issue and they were quick to fix the problem and get everything running smoothly again. I highly recommend MedMinder. The Jon pill box unit has been a lifesaver for our family. It's for my mom, who was, before the MedMinder, totally non-compliant with her medication. The Jon pill box, along with the refillable trays, are simple to use and mom is now taking her medication 4 times a day regularly. Support staff at MedMinder, especially Nick, are wonderful! Thank you MedMinder! Medminder helped my mother to remain independent for months longer than she would have otherwise. She had previously been taking too many pills because she didn’t remember already taking them. The setup is easy and customer service is fantastic. Highly recommend to anyone whose loved one has memory issues. MedMinder was fantastic for my mom. We called it the magic pillbox. When I got it for her, it was like her dementia was reset by a whole year. I hadn't realized how much she'd been messing up her pills up until then, and how much that was affecting her. She quickly got used to it, and it was a real life-saver. I recommend it whole-heartedly. My husband who has Parkinson’s and PDementia takes 13-pills daily. When I used the traditional seven-day box, he would take meds from the wrong day, the wrong time, he would accuse me of not filling his case, of not putting a med in when I knew that I had - I always double-check each section after filling his complete tray. 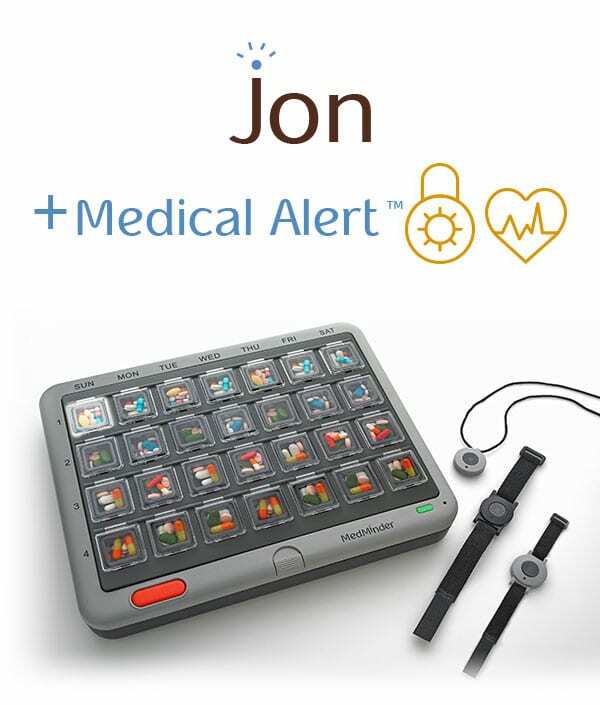 With the Jon version, he is notified by a flashing light for 30-mins; he’s then notified 30-minutes later by an alarm (for 30-mins.) It’s impossible for him to take a med at the wrong dosage time. We no longer have arguments about what he needs to take, or if it was taken. I don’t have to remember when he needs to take his meds because of the lights and/or the alarm. One-hour after his dosage time, if he hasn’t taken a pill, the system calls my phone.// I can also login and check when he has actually taken his meds.//The company‘s customer service is probably the best I’ve ever dealt with: expedient, helpful, and supportive. Excellent system, easy to use and fantastic support. Very helpful and friendly telephone support staff, from billing, to tech support, to shipping/receiving...! MedMinder is a priceless tool for my Mom who is still living independently in senior housing but gets forgetful. Having the MedMinder device allows Mom to continue to live independently - no need to pay for an expensive nurse to bring her pills to her daily which is expensive and intrusive. 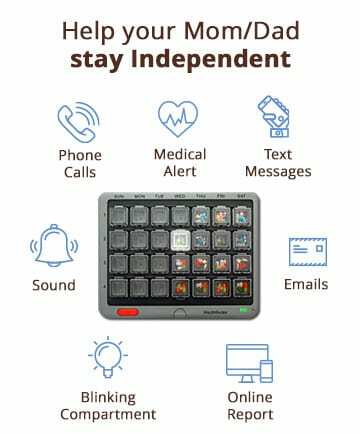 Mom loves the gentle reminder and independence that MedMinder gives her daily. Thank you MedMinder! We are so grateful!!! Best homebase medication dispenser on the market. We were extremely pleased with the product and their customer service unbeatable. Highly recommend. This Medmnder machine has truly been heaven sent! I started using it for my dad in 2015 when my mom passed away. My dad has been diagnosed with a very mild form of Dementia, since my mothers passing he has been living alone thanks to Medminder! If it wasn’t for the Medminder machine I would have had to move in with him immediately after my mom passed just to give him his meds! Medminder has allowed him to be able to live independently and have privacy for an extended amount of years! It has given me the ability to rest assured knowing that he is not making any mistakes with his medication and as a bonus I can see that he woke up in the morning and that he went to bed at night by checking the detailed log online! I would suggest that ANYONE who has a Loved one who is either on complicated medication regimens, has Dementia, Alzheimer’s or any type of problem that could interfere with them taking the right medication at the right time on the right day, GET Medminder! This machine does EXACTLY what they say it does! I have NEVER had any type of problem with it operating EXACTLY like they describe! Their customer service is exceptional! The record keeping log online is so convenient and helpful! It helps with his doctors appointments and gives me the ability to share his medication regiment with other loved ones, doctors, hospitals, nurses or caregivers just by logging in! It’s VERY simple to set up and use as well! The alarm is VERY LOUD and even though my dad is hard of hearing he has not had any trouble hearing the alarm himself! The only suggestion I would make is to not wait to start your loved ones on Medminder! I started my dad using Medminder immediately after my mother’s passing and did that so he would already be in the habit of using it before his memory or mind deteriorated or got too bad! He LOVES IT TOO! It has truly increased his quality of life and provided me with comfort in knowing there’s no way he can make a mistake or take the wrong Med at the wrong time! With no contract to sign or committed cost, what have you got to lose, give Medminder a try! I only wish I could give more stars! MedMinder helped keep my dad independent for two years. Before that, he had trouble remembering to take his pills or would take them twice. I loved that the system was locked and I could control settings from my phone. It would send me alerts and provided an overall picture of compliance. I recommend this to anyone who wants to keep their loved one independent. We used MedMinder with my sister. This machine is absolutely wonderful. No more having her stressed about if she took her meds. I would give them Five Star rating. I am completely thrilled and extremely satisfied with MedMinder. No other pill dispenser I have purchased in the past has been as efficient and easy to set up and use. Just the fact that I can schedule the medication doseage times online is huge. Trying to program other pill dispensers I'd purchased earlier required me to push buttons simultaneously, etc. to set medication times. The process was confusing and frustrating. Plus, I never knew if she'd actually removed the pills from the dispenser. With MedMinder I know. It has removed so much of the stress and frustration I've had trying to help her take her meds correctly. I also love the text alerts letting me know if she didn't remove her medicine and missed a dose. I've had a few questions along the way and tech support was available and able to answer my questions immediately. Plus, they were super nice and knowledgeable. My mom is 88 and has dementia. MedMinder, with it's capabilities, cost and tech support is the only way she is able to continue to live independently. Thank you MedMinder! You are an answer to my prayers! Very easy to use, easy to customize with the online interface and customer service is wonderful. We used for my Dad, who was at the beginning stages of dementia in February of this year. It gave him a few months of independence before he had a heart episode that made his dementia get rapidly worse. We used it with not issues for 7 months. We added the medic alert after a few months, and it literally saved his life when he wandered outside in a thunderstorm. I highly recommend Medminder. This product was perfect for my mother-in-law. She takes several medicines and although we would have them ready for her in a pill organizer box she would forget to take them or take them at the wrong time. We were looking into an assisted living apartment for her to manage her medicine, but my husband found this product online. She has been using it for about a month and it works beautifully. This product has allowed her to stay in her apartment and stay healthy and happy. This unit (Jon) was AMAZING for my mother - peace of mind that she didn't take the wrong meds and the customer service was always impeccable! We had a few issues with the internet setup and always someone was on the phone walking me through it and troubleshooting and/or sending replacement unit immediately. This product (and the people behind it) made my mother's final years so much easier for us both. My family will always be grateful. We bought a Medminder locking pillbox for my dad after he accidentally overdosed on his medicine. It is a great product which allowed my dad to retain some independence while providing me with piece of mind. I love that it notified me when he missed a dose. I could login online and change the dosage time so he could take the missed dose. I also loved being able to see online if he had taken his medicine without having to call him after every dose. Customer service was great! This product is amazing. My 84 year old mother lives independently and was mismanaging her medication. She was hospitalized twice due to getting her meds confused. I happened to be looking for something to assist her and found MedMinder. My piece of mind and her safety has changed due to MedMinder. They send me text messages regularly and it is a wonderful way for me to check on my mother without her even realizing. I LOVE MY MEDMINDER. I have only been using the device for four days, but so far I am very happy. Customer service has been eexcellent. I've contacted them several times and have been treated with friendly and helpful staff. Even when my needs changed they were very accommodating.My dad didn't like the size of the device at first. We are using the Jon model. But we moved it to a different location and now he is happy with it. He has been diagnosed with frontotemporal dementia and since he has been taking his meds at the proper time he seems to feel much better.The device blinks when it's time for him to take his meds. It will beep as a reminder after a half hour. It will call him after an hour as a reminder. If it calls him, I receive a notification. I can set the notifications to my liking. He doesn't have or need an internet connection with the device.So far, so good. Hopefully this device will help him live at home independently for a little while longer! This has been a life saver for our family. The customer service has been awesome. It is easy to set up. I don't have to worry if mom is taking her medicines. We used a Medminder for about the last 6 months of our dad being able to live in his own place (he's in an assisted living facility now). Was it ever a lifesaver! It took him a bit of time to adjust, but after a few weeks, things were going MUCH more smoothly than before. We finally had the relief of knowing that his meds were being taken, after a long period of struggling with that issue.Any problems or questions we had were quickly answered by customer service. We were impressed and pleased with the device and the company. THANKS so much! Great medication dispenser. Since using MedMinder I do not have to worry about my loved one missing a dose of medication or taking incorrect medication. This was the best thing that we have ever found! My sisters and I have the Jon box for my Mom. It has given us such a peace of mind. I highly recommend this product for anyone who needs help managing medications. It's hard enough to remember if you have taken your dosage or not but with this system, it manages everything for you. Very simple to use and the customer service has been awesome! More people need to know about this .. spread the word. We've used a Medminder for our dad for a year now and I highly recommend it. My dad who suffers from dementia, went from less than 50% compliance to 100%. The only reason I give it four stars is because we did have to replace the first unit when it began having startup problems. However, the people at Medminder were great and replaced it quickly and without problems. I highly recommend the Medminder system and it has helped my parents enjoy independent living longer. Two weeks ago, I started my mother on the "Jon" lockable MedMinder system. I'm thrilled to report that this is the first two weeks this year that I know she's remembered to take the right pills at the right times throughout the day. I was using the MedCenter 31-day system before. She lives alone, has early dementia, and would often let an entire day go by without taking her pills, then she would simply pick out the next one in line. (I once found her 4+ days behind). In recent months, if she knew I was coming over, she began to hide/stockpile any pills that she had missed, so it wouldn't look like she had missed any. With the locked box, that's no longer possible; what's more, it's not necessary because she hasn't missed any.I was concerned also, about being the only caretaker, and the only one able to refill her meds. After consulting with the Pharmacist at Kroger, I have turned her meds and the MedMinder refill boxes over to his care. A refilled tray is picked up each Monday, with her groceries, and installed by me or a hired caregiver. The monitoring system is such a selling point. The first night, she didn't close the pill compartment correctly so the alarm continued to sound. I was notified by text within minutes of her unplugging the system and was able to call her and fix the problem. In the days following, I considered turning off the alarm since she was doing so well taking them when the box unlocked and lit up. However, I have since been able to monitor that she more consistently waits till the alarm reminds her. Thank you for the best system possible short of hiring a nurse to go by twice a day to administer her meds! 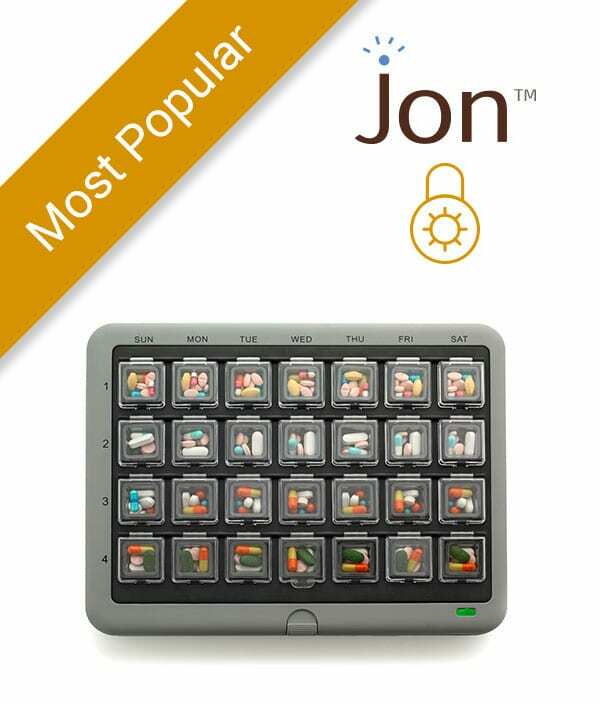 This genius product (Jon) has taken away the burden (and temptation) of managing my multitude of medications since my injury and subsequent rhabdomyolysis. It's like having my nurses back, but in my own apartment. Thank you Medminder! Customer Support is fantastic - they responded to my email immediately to let me know that they are looking into the issue. I've been using two MedMinders for over a year now and couldn't be happier with the product and the service. We got a Maya MedMinder for a family member last year, and it has been fabulous. She's in her mid-80s, has been living with dementia for a number of years, and can't keep the days straight. She lives independently in an apartment for seniors. Before she had the MedMinder, she would take pills on the wrong days or even take her morning/evening pills twice sometimes, but she's done great with this. And we can double check her online or know if she's up to something with the email alerts. (The fact that the person without internet or a cell phone can 'spam' me with medminder alerts makes me giggle.) The website is also particularly helpful for us if my she leaves her telephone off the hook. Even if we can't immediately get her on the phone, we can log in online and see when she last took medicine. If only Medminder would make a telephone that disconnects from the phone line and hangs up without being properly placed in its cradle!At first, my she didn't want the Medminder, since she could "remember to take her pills without a reminder," but she agreed to try it for a month. After a few weeks, she had forgotten her resistance to the new pillbox, was used to the system, and it became the new normal. It's really been terrific, and now she says her "pillbox is just great!" I'm so grateful to the person responsible for inventing The MedMinder! When I became my mother's caretaker it was a day to day challenge with her medications! So after researching the internet I discovered the best device ever! I've shared this with my mom's doctor, her home health nurse, co-workers, and friends! I just truly want to thank everyone who played a part in producing this product! 100% compliance in the first two weeks!!! 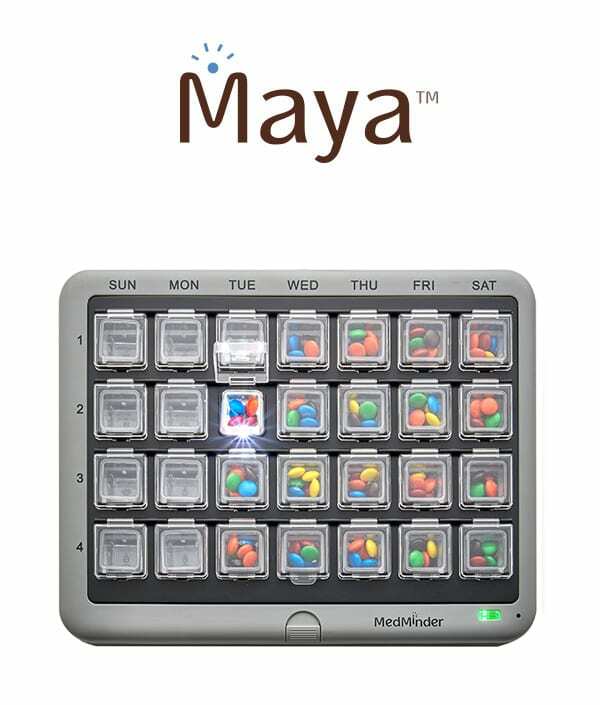 I came across MedMinder while searching for a monitored pill dispenser for my parents and couldn't be more pleased. It was easy to set up, takes up little space, and best of all, I can monitor, adjust dosage times, and get alerts from 240 miles away. My parents went from missing doses, partial doses, and sometimes no meds at all to taking everything they should at consistant times. All this without making reminder calls and the fear of not knowing what they were doing. Another plus is that my two brothers can get alerts and monitor the MedMinder too. Thank you for all of your help and for helping to maintain my parents health and lifestyle. We looked at several medication dispensers, but this system stood out amongst all the rest. It's extremely easy to use for both the patient and the caregivers. Great refill trays make weekly refills as easy as can be. I love the size of the cups because they fit many pills and I can put a diabetes testing strip in there to remind him to check his sugar levels at the appropriate times. It has made a world of difference with medication compliance and overall well being for the patient. 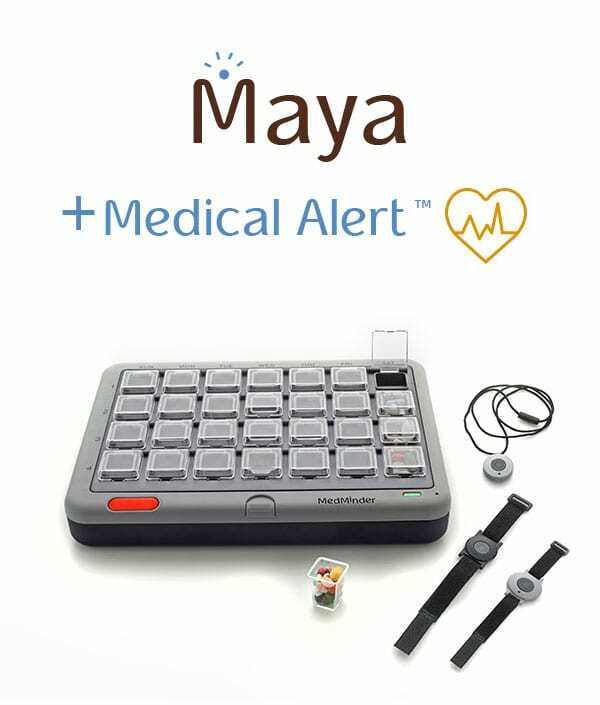 Thinking of getting another box for patients spouse with the medical alert system. I love that I can select the time frames that medication is accessible so no double dosing can occur and I get phone/text notification if a med has been missed. Couldn't be happier. No regrets. Medminders Jon box has changed our lives....my father in law with dementia can keep his independence and us as his caregivers can have piece of mind...thank you medminder.